What the?? Anyone recognize this plant?? but what in the heck is it?? It's cool because the underside of the big leaves have a tiger print pattern!!! Does it grow babies on the leaves? maybe its kalanchoe daigremontiana (mother of thousands) that has a pattern under the leaves too. It looks like a small "mother of millions",, I have one a bit smaller. At least that's what it was sold to me as, and it does look like one. Your's looks the same. Thanks, both of you.. I looked up "kalanchoe daigremontiana" and found only one picture of a plant that looked like the one my friend has. 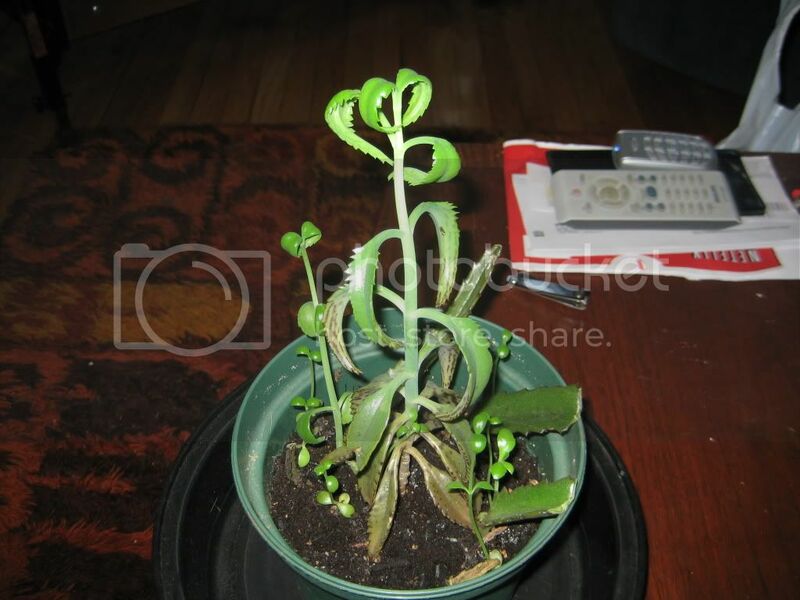 The problem is, hers doesn't have those... offshoots on the leaves like 90% of the pictures of "mother of thousands" or "mexican hat plant" have.. Perhaps this one is young or sick?? Your's is young like mine, so I think, we have to wait till they grow up. LOL then my little pup is even younger!! Any special advice for caring? Oh my goodness! The leaves are much wider, flatter.. and have those lil thingies! What a difference between the two individuals! I was just thinking the same thing!!! !..........I think I need to put mine in more light. It's tall and weedy looking like your's. Maybe that's what's wrong? NIKKI702-------Do you fertilize your's? I did look close at mine, and it does have the striping, and is trying to get those little things on the leaves. Any ideas on how we can make our's stronger, and look as healthy as your's nikki702--??????? nikki702.........I think you must be right, because mine certainly doesn't have leaves that wide and thick. But I thought they were all the same??? Do you have a picture of your's showing it standing up, not from the top down? Would be very interesting to see. Thanks so much. Obviously lots to learn!!! For me about the different types of these plants? @tinypixie - I think yours need more light which will bring up the purplish coloration. I also think the soil looks too heavy (looks like topsoil?) If you look at the others, they are planted in somewhat gravelly mix (about 10-15% smallest aquarium gravel, 10-15% builder's sand. OR something like the patio paver underlayment which is a mixture of sand and gravel). The downward curling of the leaves I think is symptom of the heavy soil and struggling root system. The babies will form by the "thousands" when the plant is happy and healthy. I haven't had one in a while but when I did, It was kept a group with other sun-loving container plants, and the babies basically RAINED down on them and rooted everywhere.